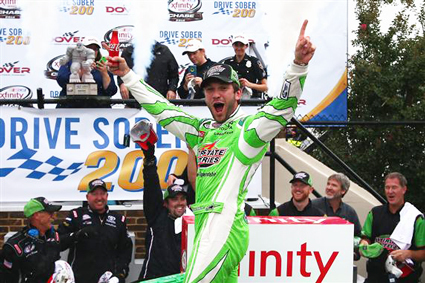 With a dominant car that opened leads of more than six seconds after the final restart on Lap 152 of 200, Daniel Suárez won Sunday’s rain-delayed Drive Sober 200 at Dover International Speedway and earned a spot in the Round of 8 in the inaugural NASCAR XFINITY Series Chase. The Mexican-born driver grabbed the top spot from eventual third-place finisher Justin Allgaier on Lap 155 and quickly pulled away. 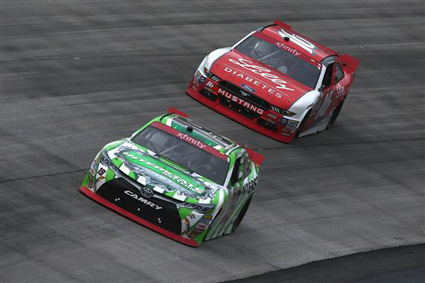 Ty Dillon passed Allgaier for the runner-up spot in the closing laps but finished 5.625 seconds behind Suárez, who won for the first time at Dover and the second time this season. 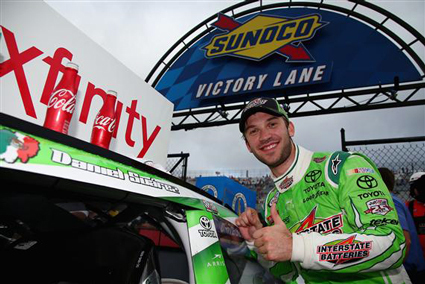 "I’m very proud of this team – the 19 Interstate Batteries Toyota Camry," Suárez said. "They did a really good job today, and the guys just brought an amazing car. We had a ton of speed. This is one of those races that you would feel bad to lose." Suárez’s Joe Gibbs Racing teammate, Erik Jones, didn’t share the good fortune of the race winner. The winner of the Coors Light Pole in Saturday’s rain-shortened qualifying session, Jones developed a vibration in his right front wheel and made an unscheduled pit stop on Lap 100. A caution on Lap 139—after fast-closing Suárez tangled with Justin Marks in Turn 1 and sent Marks’ No. 42 Chevrolet into the outside wall with enough force to lift all four wheels off the pavement—gave Jones the opportunity to get back on the lead lap with a wave-around, but Jones had to pit for two seconds of fuel with seven laps left and fell to 16th at the finish. "I'm disappointed, you know?" Jones said. "It's not how we wanted to run, for sure. Not a good day for us. Just frustrated and just really disappointed in how the first couple weeks have gone in the Chase. "We've run so strong all year, and now to kind of fall on our face here the last couple weeks has been unfortunate. Just need to have a good day at Charlotte. We need to make up four points, get to the next round and start over. Hopefully, we can do that." 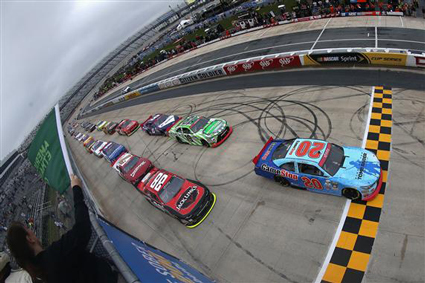 Jones and Dillon, who wrecked while battling in the top five last weekend at Kentucky, remained outside the top eight in the Chase standings, with an elimination race looming on Friday at Charlotte Motor Speedway, where the Chase field will be trimmed from 12 to eight. Dillon is three points behind 15th-place finisher Brennan Poole in eighth place, with Jones, who leads series regulars with five victories this season, four points back in 10th. Suárez, an alumnus of NASCAR’s Drive for Diversity program, expressed regret at the incident that ended Marks’ day. Suárez closed very quickly on new tires and hit Marks’ Chevy from behind when both cars moved to the bottom of the track to pass a lapped car. "I want to apologize to the 42," said Suárez, who leads the Chase standings by two points over seventh-place finisher Elliott Sadler, who won last Saturday at Kentucky. "It wasn’t my intention to wreck him that way. I felt like I had the inside line and he went to the bottom and I apologize for that." Notes: The race was delayed from a scheduled Saturday start because of rain. 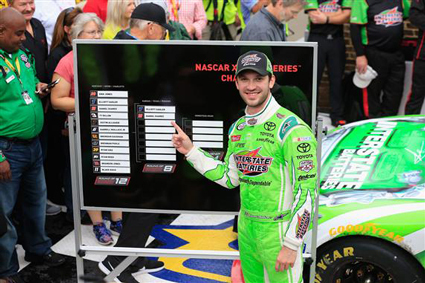 ... Corey Lajoie finished a career-best sixth, his second straight top 10 in an XFINITY race. ... J.J. Yeley’s eighth-place finish was a season-best. 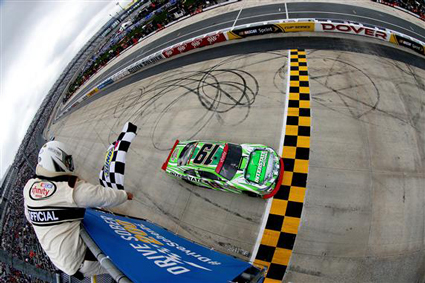 ... Ryan Blaney finished fourth in a substitute role for Joey Logano, who opted not to compete in the XFINITY event, when it was postponed to Sunday, the same day as the Chase for the Sprint Cup elimination race at the Monster Mile. ... Alex Bowman ran fifth in the No. 88 JR Motorsports Chevrolet. (5) Daniel Suárez, Toyota, 200. (7) Ty Dillon, Chevrolet, 200. (3) Ryan Blaney(i), Ford, 200. (4) Alex Bowman, Chevrolet, 200. (19) Corey LaJoie, Toyota, 200. (8) Elliott Sadler, Chevrolet, 200. (25) JJ Yeley, Toyota, 200. (13) Brendan Gaughan, Chevrolet, 200. (22) Ryan Reed, Ford, 200. (9) Darrell Wallace Jr., Ford, 200. (11) Ross Chastain, Chevrolet, 199. (10) Regan Smith(i), Chevrolet, 199. (20) Blake Koch, Chevrolet, 199. (12) Brennan Poole #, Chevrolet, 199. (1) Erik Jones #, Toyota, 198. (16) Brandon Jones #, Chevrolet, 198. (18) Ryan Preece #, Chevrolet, 198. (14) Ryan Sieg, Chevrolet, 198. (21) Dakoda Armstrong, Toyota, 197. (2) Drew Herring, Toyota, 196. (17) Jeremy Clements, Chevrolet, 196. (29) Mario Gosselin, Chevrolet, 196. (23) Ray Black Jr. #, Chevrolet, 195. (28) Brandon Hightower, Dodge, 194. (33) Garrett Smithley #, Chevrolet, 191. (35) Joey Gase, Chevrolet, 191. (31) David Starr, Chevrolet, 190. (38) Derrike Cope, Chevrolet, 184. (40) Mike Harmon, Dodge, 160. (15) Justin Marks, Chevrolet, Accident, 137. (26) Jeff Green, Toyota, Ignition, 103. (24) BJ McLeod #, Ford, Electrical, 75. (34) Morgan Shepherd, Chevrolet, Handling, 65. (39) Matt Waltz, Chevrolet, Engine, 64. (32) Ryan Ellis, Chevrolet, Accident, 58. (37) Jordan Anderson(i), Chevrolet, 57. (36) Timmy Hill(i), Chevrolet, Transmission, 44. (30) Josh Wise(i), Ford, Engine, 1. (27) Matt DiBenedetto(i), Toyota, Accident, 1. Average Speed of Race Winner: 104.076 mph. Time of Race: 1 Hrs, 55 Mins, 18 Secs. Margin of Victory: 5.625 Seconds. Caution Flags: 4 for 35 laps. Lap Leaders: E. Jones # 1-9; D. Suárez 10; E. Jones # 11-36; R. Black Jr. # 37; E. Jones # 38-56; D. Suárez 57-123; E. Sadler 124-126; B. Koch 127-141; C. LaJoie 142; D. Suárez 143-151; J. Allgaier 152-154; D. Suárez 155-200. Leaders Summary (Driver, Times Lead, Laps Led): D. Suárez 4 times for 123 laps; E. Jones # 3 times for 54 laps; B. Koch 1 time for 15 laps; J. Allgaier 1 time for 3 laps; E. Sadler 1 time for 3 laps; R. Black Jr. # 1 time for 1 lap; C. LaJoie 1 time for 1 lap. E. Jones # - 2,053. Can Indianapolis Be The Answer To Dillon’s Two Year Win Drought?